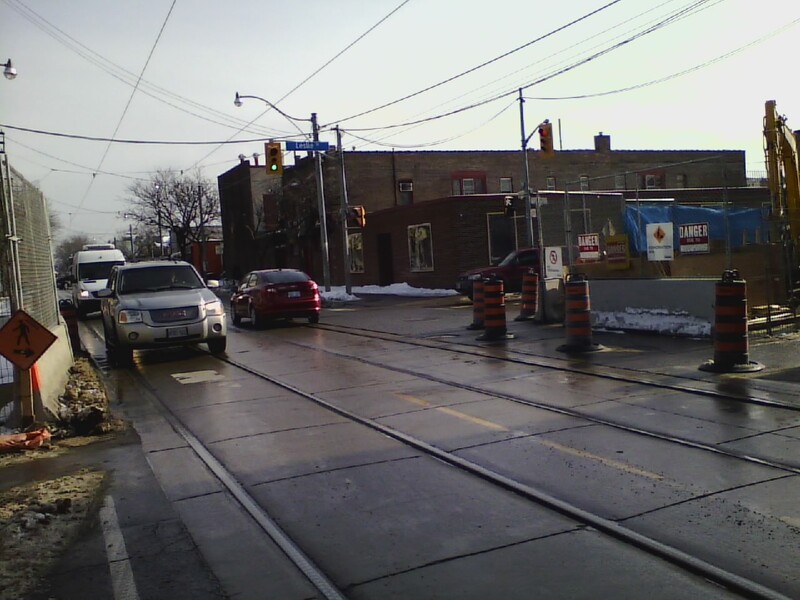 This is one of three articles I am publishing this week on the condition of cycling and pedestrian detour infrastructure around the Leslie Barns new Streetcar Barns project – and the Leslie Street reconstruction to accommodate Street Car rail beds. Specifically I’m looking at the condition of the Lower Don Recreation Trail and the Martin Goodman Trail through the area, and connections to that important and essential infrastructure. I started my walk at the corner of Queen St. and Leslie St. – where the TTC Leslie Barns street reconstruction has narrowed the through lanes at the intersection down to one lane in each direction on both Streets. Cyclists who have confidence issues driving with car traffic may want to choose another route around this as you’ll have to change lanes across street car tacks in likely slippery conditions, and ride with car traffic in the centre lanes. North-West Corner of Queen St and Leslie – looking south-east at the intersection. 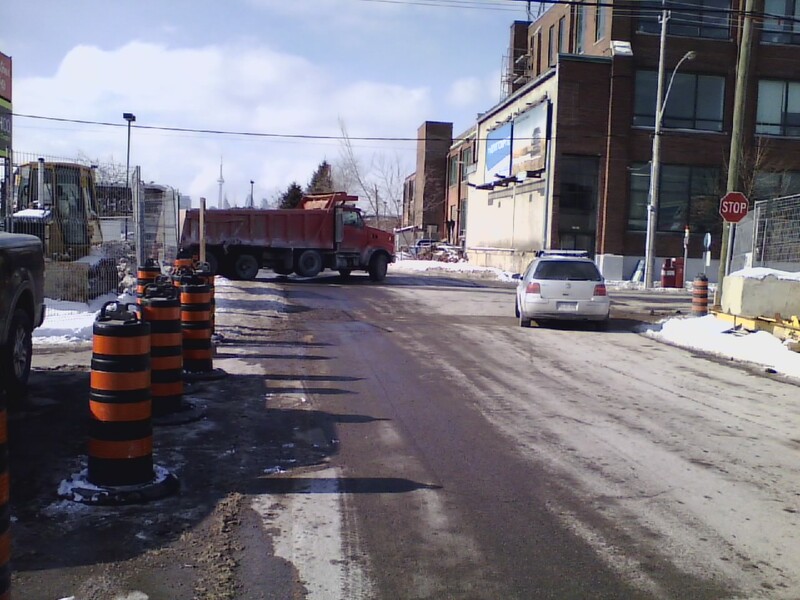 Leslie street continues north through the zone with one lane – one-way northbound, as usual. Southbound Leslie is one lane in each direction. Looking westbound along Queen St E. just East of Leslie St. from the North side of the street. The curb lanes in either direction on Queen have been closed. Looking North at the intersection from the construction median. 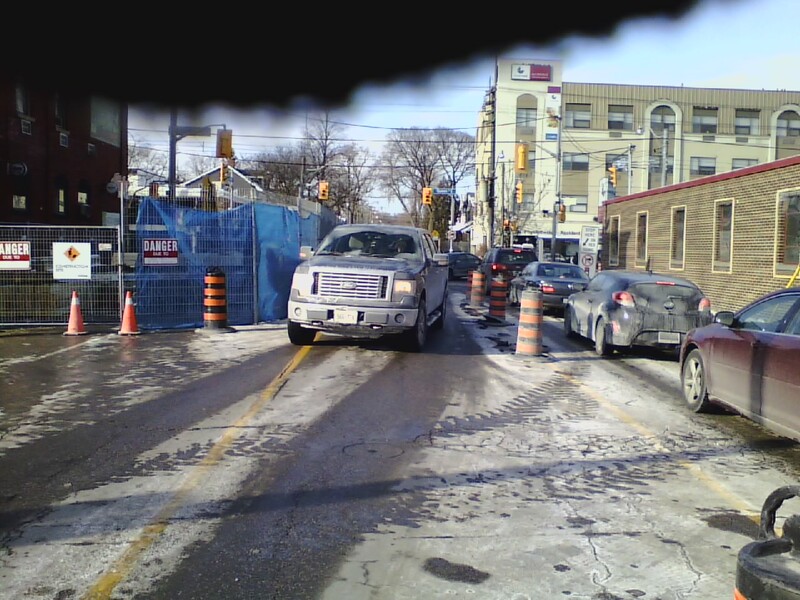 Standing in the centre construction median on Leslie St – looking North at Queen St. – watching an SUV turning right down Leslie from Queen; while northbound cars line up at the light. It’s a construction zone – be careful – but as in all construction zones, traffic is moving pretty slow due to the narrow lanes. The West-side sidewalk is still detoured West on Moseley for about 25m. 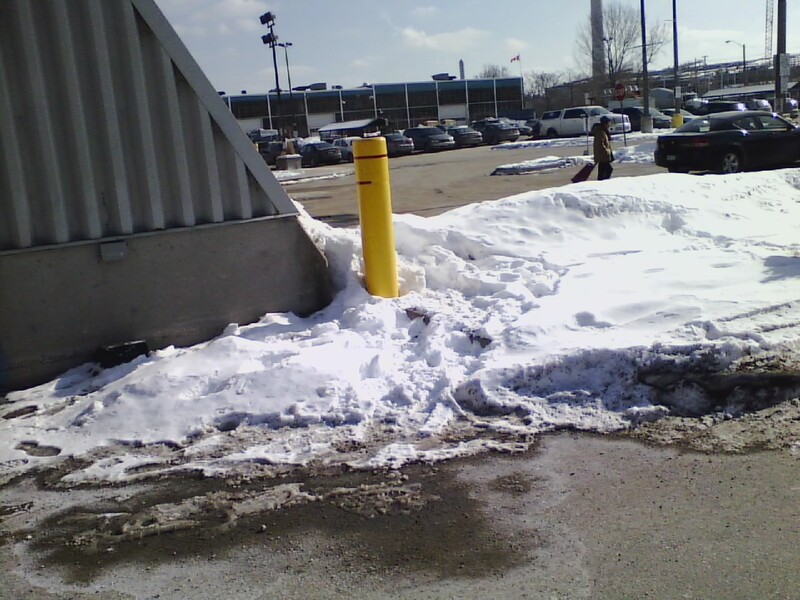 The East-side sidewalk along the edge of the Loblaws lot is still a ‘sidewalk to no-where’. It ends about 40m North of the Plaza Entrance Intersection. 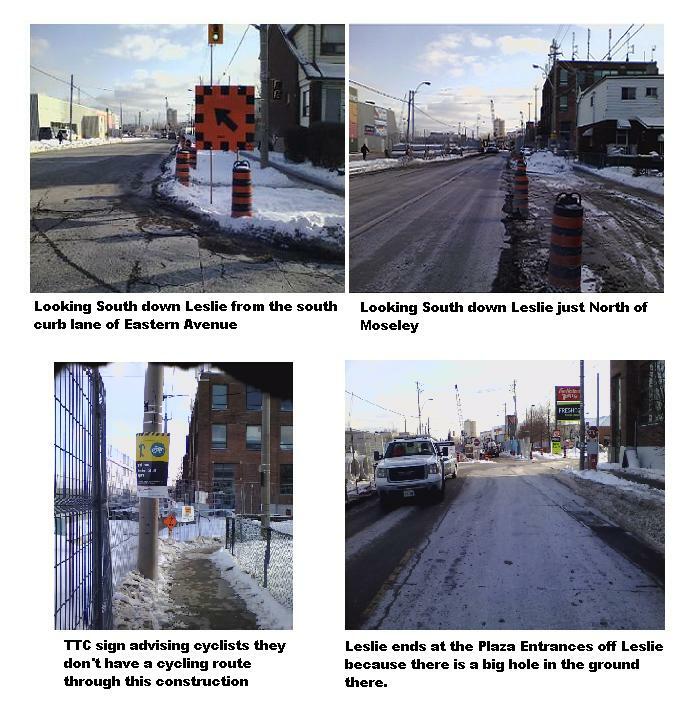 Through the TTC Leslie Barns Public Liaison Committee I’ve notified Loblaws, FreshCo and Transportation Services that the situation for peestrians and cyclist in and around these parking lots is very dangerous and does not allow accessibility — and suggested fixes. There is no signed or painted route for Pedestrians at any point South of here – folks are using the driveway, the parking lot, the Entrance-way lanes to Leslie St and the Drive-Tru’s at the fast food joints as sidewalks. Tracks in the snow at the end of the sidewalk-to-nowhere, indicate that pedestrians are using Leslie Street and the driveway in the Loblaws lot to go North-South. Left: Loblaws One-way Southbound driveway-come-sidewalk. 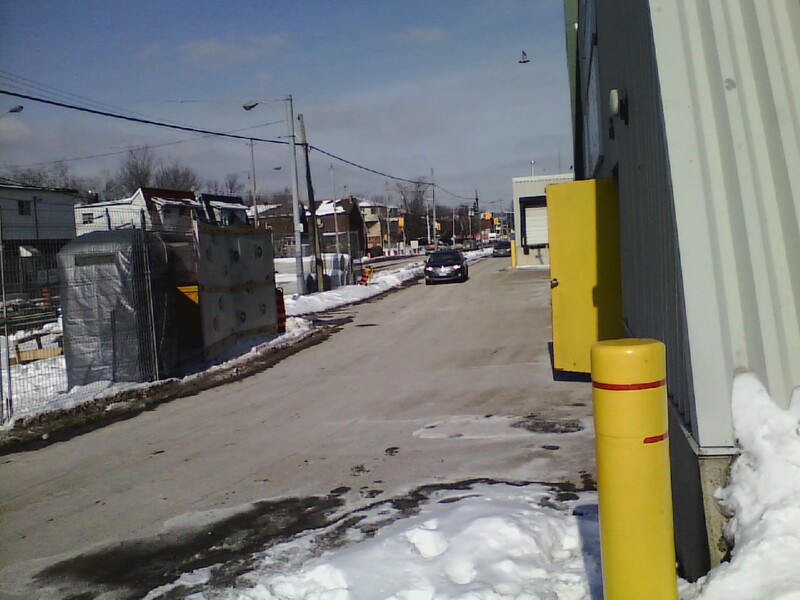 Right: Egress to Loblaws South-side entrance doors from the ‘Driveway-Sidewalk’. Just South of there – at the Loblaws, Leslie St Entrance – Pedestrians are crossing Leslie along the South side of the intersection. I’m standing on the defacto pedestrian-way. There are no markings or signs showing pedestrians where to go – or same to let drivers know that they should expect people walking. As they arrive in the Loblaws Parking lot there are no markings or useful signage. 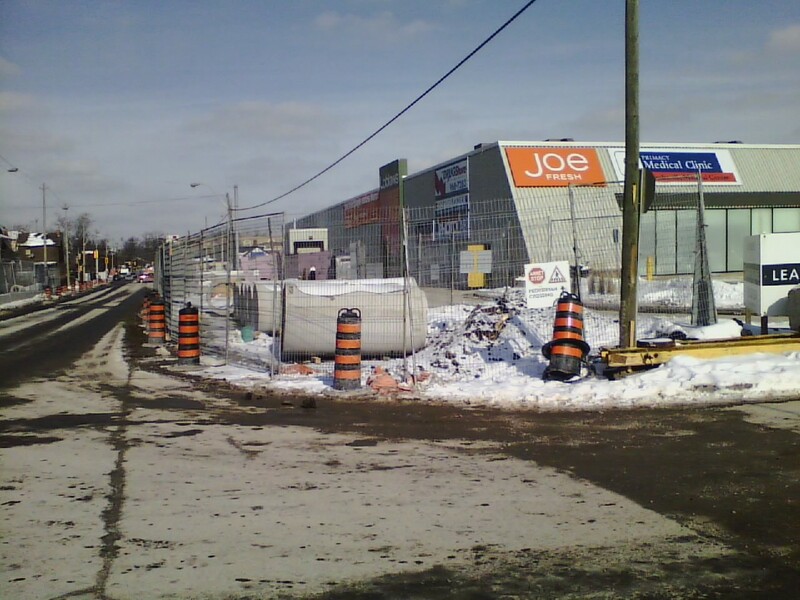 Below is a useless warning sign on the construction fencing on the North side of the Loblaws Leslie St Entrance – facing the wrong way..
Pomerleau Construction’s Pedestrian Warning Sign (behind the pole and the cone on the fence) at right-angles to the defacto pedestrian crossing point. 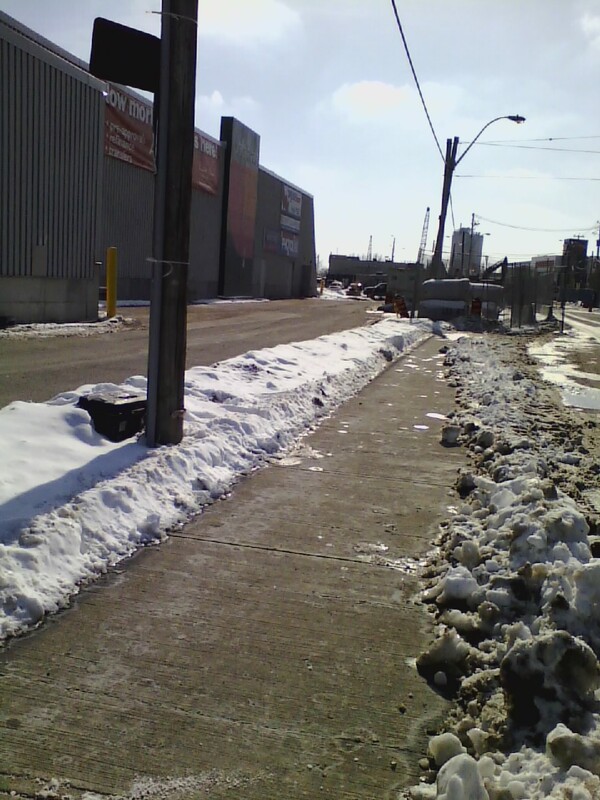 Further South I noted a foot-path in the snow leading towards the North-East corner of Leslie St. & Lake Shore Blvd. 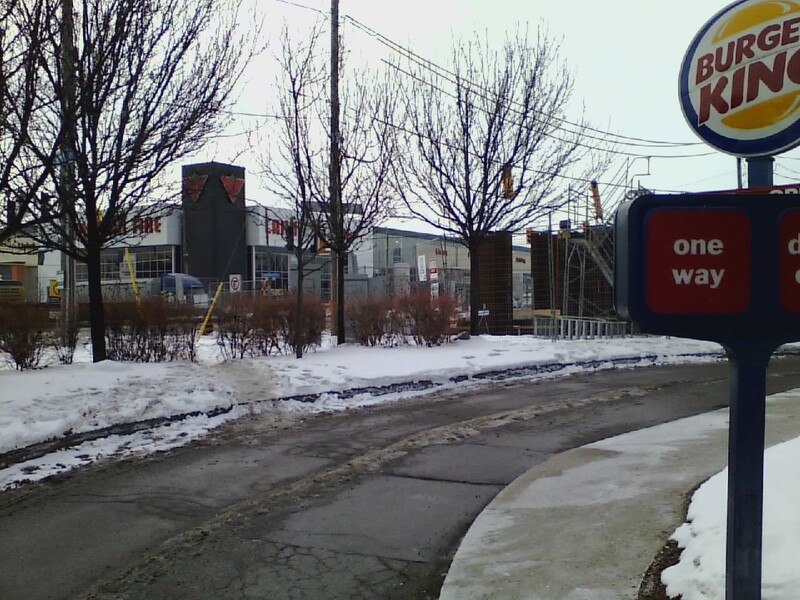 – indicating pedestrians are walking through the Loblaws parking lot – across the entrance-way lanes – and then through the Burger King Drive-Thru lanes in order to complete their North-South trips. I found the same thing at The Tim Hortons / Wendy’s on the North-West corner. Foot-path off the Burger King Drive-Tru – looking South to Lake Shore Blvd. 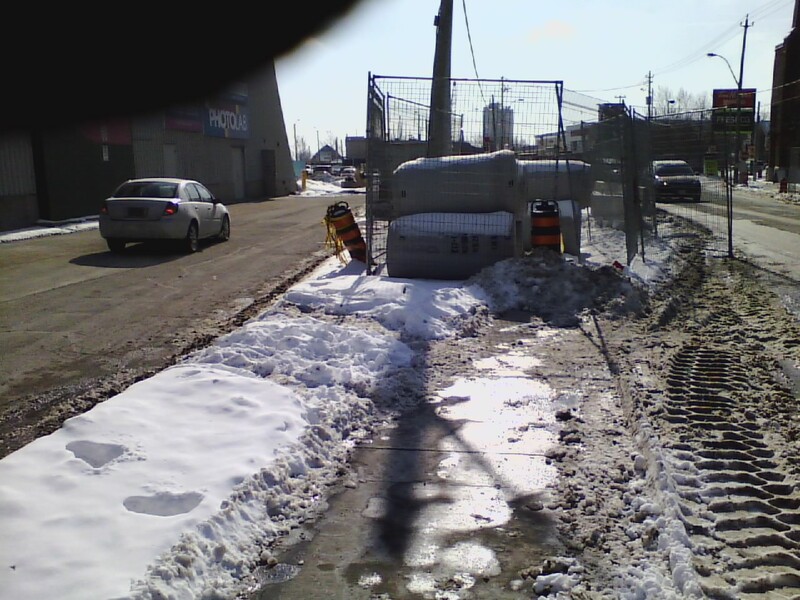 and Leslie St.
On the West side, I found the sidewalk between the west fence of the construction zone and the Tim Hortons / Wendy’s Drive-Thru, for 3 days the condition of the sidewalk was a one-foot-directly-in-front-of-the-other narrow path. Baby strollers, walking assist devices, wheel chairs and two-way foot traffic are all defeated by this sub-par snow plowing. @TTCLeslieBarns has informed me this sidewalk is City of Toronto responsibility. The crosswalk across Leslie Street on the North side of Lake Sore Boulevard could be much wider – by about 1.5m wider by my measurement. If a concrete barrier – like is being employed on the right in the picture was installed it would better separate car and active modes – and making the area safer for active transportation users. The Crosswalk across Leslie St on the North side of Lake Shore Boulevard could be twice as wide. About 2m on the left in the picture is being used for snow storage. 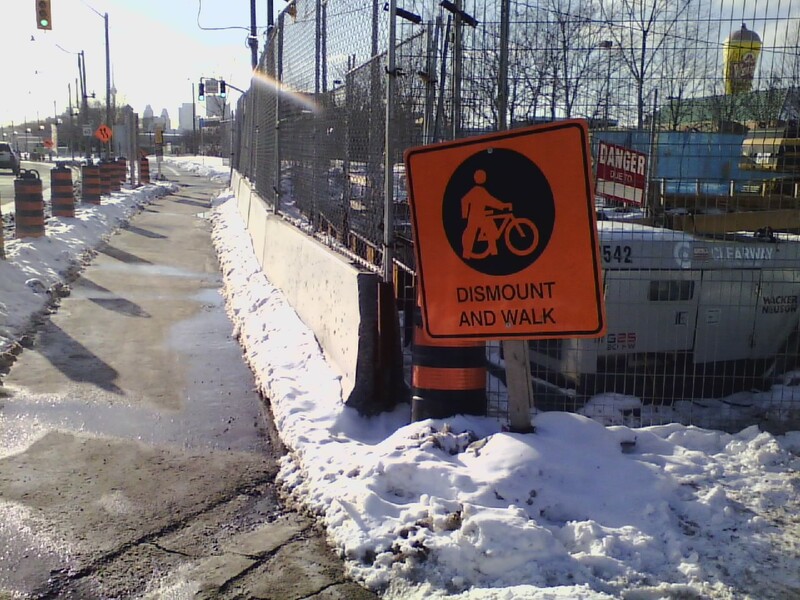 More on Walking and Cycling detour conditions around this major construction coming soon. Next time the LDRT at the Temporary Entrances to the two Big Box Stores “Plazas”; and South of Lake Shore – the MGT.